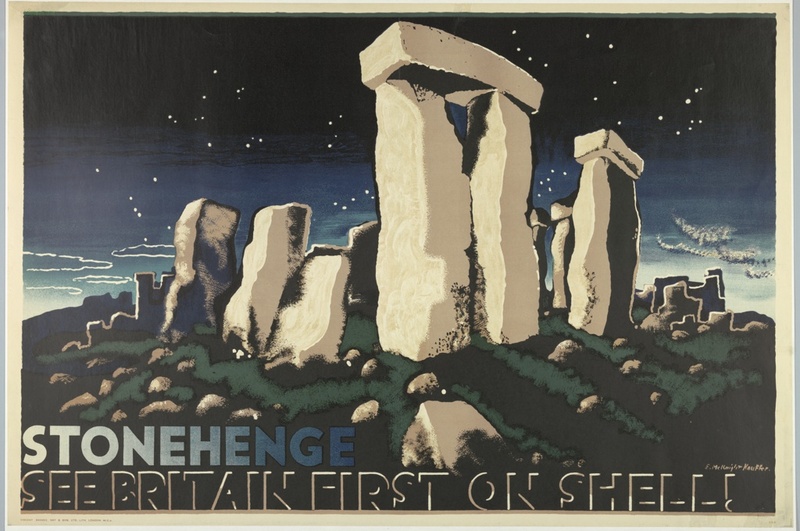 See more objects with the tag travel, travel posters, advertisement, stones, rock formations. See more objects with the color darkslategrey antiquewhite darkkhaki darkslategrey darkslategrey or see all the colors for this object. This is a Poster. It was designed by Edward McKnight Kauffer and printed by Vincent Brooks, Day & Son and made for (as the client) Shell-Mex and BP Ltd.. It is dated 1932 and we acquired it in 1989. Its medium is offset lithograph on paper, mounted on thin board. It is a part of the Drawings, Prints, and Graphic Design department. This object was fund: Friends of Drawings and Prints and catalogued by Virginia McBride and Kristina Parsons. It is credited Museum purchase from Friends of Drawings and Prints Fund. Printed in script, in beige ink, lower right: E. McKnight Kauffer. Printed in beige ink, lower left: VINCENT BROOKS, DAY & SON. LTD. LITH. LONDON. W.C.2.